The Big Idea: Creating stories together can help build vocabulary, collaboration, and communication skills. 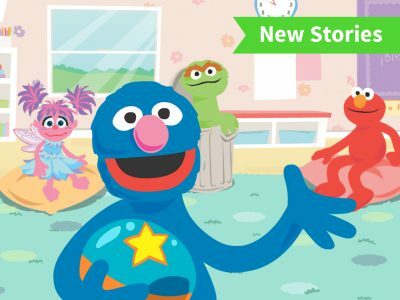 Create stories together with Grover and friends! Help children follow the prompts to let the Sesame friends take turns contributing to each story. Then listen to Grover read the whole story aloud. Play again and again to create different versions of each story. Creating stories together can lead to a lot of silly storytelling fun! Try doing the same with children—involve siblings, too! Making up a story together is a great chance to bond, learn new vocabulary, and explore family history and culture. You might tell a real or imagined story about a family trip, a holiday tradition, or a relative. Explain that everyone brings different ideas to a story, because everyone imagines things in different ways. Point out that most stories have a beginning, a middle, and an end. You might write down the stories you create together, read them aloud, and invite children to illustrate them on their own or with siblings or friends.